Space Cottonseed is proud to present Relays of Four Korean Contemporary Craft Artists, a series of exhibitions featuring four artists, Eunhyun Chung, Hyun Jong Kim, Youngock Kim and Yun Ryoung Lee. The artworks by the artists introduce their different artistic practices in contemporary craft art through explorations of using different materials, as well as the presentational forms of the work. In this exhibition, Space Cottonseed presents completely different works by four craft artists, which allows viewers to experience the broad range of contemporary craft in Korea. The first round of the relay comprises of works by two jewellery designers. Eunhyun Chung and Yun Ryoung Lee present a series of jewellery made of materials such as metal, silver, glass, feathers and various others. Today, the mediums explored in crafts are limitless, similar to multi-disciplinary contemporary arts and culture. The artists do not limit themselves to working with only craftsmanship, but expand their art practices to broader possibilities of contemporary art. The second round of the relay shows a series of sculptural works by two artists, Hyung Jong Kim and Youngock Kim. Hyun Jong Kim makes use of glass as an explorative medium. Experimenting with diverse colours and shapes made of glass is a crucial mission to him as a craft artist. Furthermore, he has developed his work through craft to a form of installation. Youngock Kim is a renowned silver craft artist who aims to keep traditional technique of silver craft. Through this, Kim creates traditional lines and shapes of Korean culture in her beautiful works. 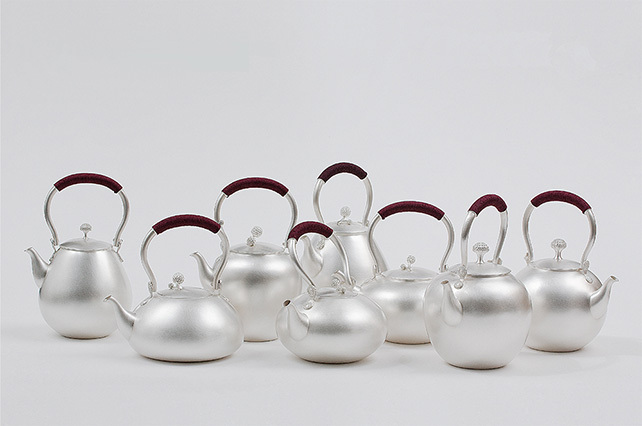 A series of Young-ok Kim’s handmade silver teapots and teacups brings through the rich history of Korean crafts in a contemporary version, which still manages to maintain a handmade aspect and tradition.